Now with a growing line of Ben Hogan golf bags and accessories, you can add to your collection of high-quality golfing supplies. Keep on reading to find out more about their iconic and exquisite golf-minded equipment. Hogan started his company 1953, which just so happens to be the same year he won three world-renowned tournaments: The Masters, The U.S. Open, and the Open Championship. Inspired by his record-setting wins, he wanted to create a company and brand that pedestaled excellence above all else. Hogan, too, wanted to do things differently than other manufacturers who, at times, sidestepped quality for profit. Now some 55 years later, the brand continues to be synonymous with class-leading quality. But if you’re already a customer, you know this. You take great pride in yourself for being an intelligent, yet passionate player—on and off the field. Whether it’s on the 18th hole or at the clubhouse bar, you know that Hogan accessories, bags, and other equipment exude brilliance. Full-length dividers to help keep carried items separately. Dual strap harness to alleviate pressure points. The design weighs in at just 6.6lbs. The seven pockets are included, with some being velour lined and waterproof. A Cloth strap with a buckle clasp for fit. Two color options are available in either white or graphite. A structured crown to ensure proper brim fit. An almost all black color scheme. Flexible fit, which means the two available sizes fit most golfers. The single cloth strap features an adjustable slider for a comfortable fit. A minimalistic design that complements a wide variety of golf looks. A low rise cut above the bill. Velcro tab with loop grab to ensure proper visor fit. Two available colors in either white or black. The sturdy construction can stand heavy gusts and accidental drops. A double-canopy design to prevent rain from puddling on the umbrella. Included carrying sleeve for when not in use. Made with a grippy elastomer, using the Ben Hogan Wedge Golf Grips will make sure you always have a firm grasp on your club. The grip also includes two circles on the back of each grip to guide correct hand placement. For those times you need to clean your drivers and putters, reach for the Tri-Fold Towel. These all-black towels are great to have hanging from your golf bag. The 100 percent cotton design also means any moisture from your golf clubs will be wiped away, as well. Each towel also features the iconic Ben Hogan signature, too. On those hot summer days when the sweat is dripping from your face, grab a Ben Hogan Player’s Towel. Made from a blend of polyester and polyamide, this golf towel is 70 percent more absorbent than other cotton-only ones. And better yet, the Player’s Towel is machine washable, as well. Ben Hogan luggage is constructed from only high-quality, durable materials. We pride ourselves on offering luggage products that are functional, on and off the course. Whether you’re slinging one of the company’s duffel bags on to a roof rack or sending their backpack through TSA, know your BH luggage was made with you in mind. Each piece of this luggage collection is as functional as they are eye-pleasing. Their ergonomic, black-and-grey designs feature a bevy of storage compartments. Also, each piece of luggage utilizes easy-to-grip handles. Hogan backpacks and duffle bags, especially, come with cushioned straps. This design feature will make lugging them around the course and while on vacation a breeze. And just in case you dirty your BH luggage, the used fabrics are easy to clean. Want to learn more about our luggage products? Keep on reading below to see what BH luggage we’re currently offering for sale. The Ben Hogan Shoe is a great, stylish addition to your collection of golfing accessories. Complete with a durable polyurethane-coated lining, you don’t have to worry about your shoes damaging the bag’s interior. The outer fabrics are made from a mix of polyester fabrics, which are just as durable. Use a Ben Hogan Duffel Bag to organize your belongings, whether you’re on vacation or the course. With included organizer pockets, comfort grip handles, and a sling strap, it’s as versatile as it is easy to carry. And at 11”-by-10”-by-25” in total size, it’s allowed by most airlines as a carry-on. The Ben Hogan backpack is perfect for work, vacation, or play. Its polyester-heavy design features many pockets. Each one can be used to store electronics, golf accessories, clothes, and more. 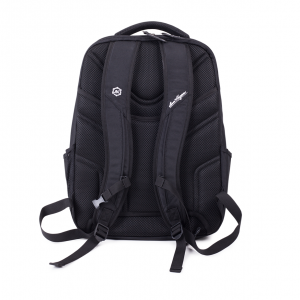 The back straps are softly cushioned so that you can wear this backpack in comfort. The inside lining of is coated with polyurethane to ensure durability. Like what you see? 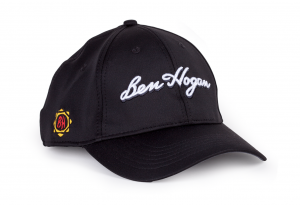 Head on over to benhogangolf.com, and check out the latest Ben Hogan golf bags and accessories so you can start adding to Hogan collection. And while you’re there, consider becoming a subscriber! You’ll hear all about our new products, news, and get exclusive offers on certain products.